Wannabe bloggers dream of getting scores of visitors to their sites. But they get a reality check every time they log in to Google Analytics. The analytics shows them a handful of visits and a high bounce rate, indicating visitors are not finding the browsing experience appealing. In fact, many bloggers jump into the fray without a fundamental understanding of how the internet really works and how the mechanisms of the internet intersect with the fundamentals of marketing. The good news is that there are plenty of resources to gain this understanding. One good one is a free ebook from www.ocoos.com. Bounce rate is among the key factors that decide the success and failure of a SEO campaign. A high bounce rate indicates the SEO efforts that you are putting on the table are not paying off. A low bounce rate, on the other hand, indicates users are staying on the site for long, which is good for your site. Lowering the bounce rate and increasing the rate of conversion are linked to each other as the former invites the latter. In this article, I’ll discuss seven effective ways to reduce bounce rate and grow conversion rate. Working on the landing page to make it more conversion-worthy may sound like the most clichéd advice, but it’s a relevant advice because the majority of marketers fail to take in what landing pages actually signify. They rush towards improving the on page experience before understanding the landing page. The image displays the results of A/B testing. All the brands whose landing pages were examined are B2C and as the image shows, the conversion rate ranges between 0.75% and 20%. A/B testing and similar methods help SEOs comprehend a landing page’s conversion friendliness. The industry, the niche, the product and user’s receptivity towards the product are all relevant data that SEOs need to consider. A page with prominent CTAs, quality content, product image and sufficient visual elements can be rebuffed if the product and the niche have compatibility issues. Similarly, a great product with poor landing page elements is likely to account for a high bounce rate and an unimpressive conversion rate. Note, the third category i.e. Tier 3 keywords are of low search volume but high converting, which means the only reason such keywords don’t send traffic to a site is very few people search with them. Now this is a bit tricky. 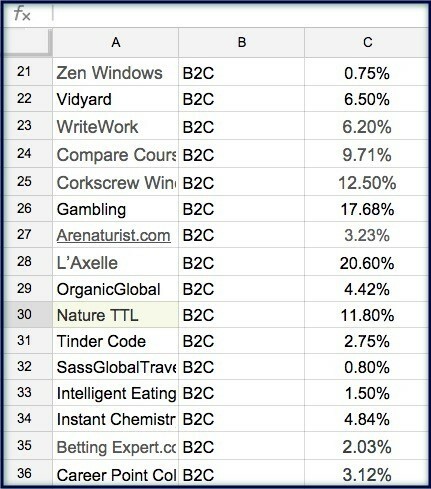 Tier 3 keywords often hail from the B2B industry. B2B products/services are purchased by businesses and not by individuals. 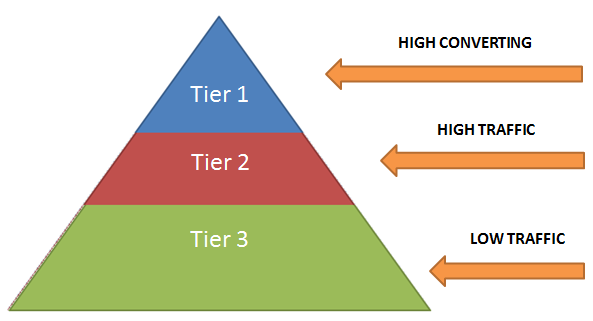 Since Tier 3 keywords are high converting as well, they may be used for B2B campaigns. The strategy here is to get customers from a small pool of visitors, who’ll buy. B2C marketers may feel a bit uneasy because B2C keywords are either high volume and high converting or high volume and low converting. The first type of keywords are outrageously competitive and the second type doesn’t lead to a decent ROI. They can try not Provided keyword ideas as such ideas expand their campaign’s reach. The idea, even though a bit new, has been around for a while. Experts have endorsed it as a fresh take on content modeling. There’s something really innovative about deep content. It brings enterprise content management closer to optimizing a site for search engines. How it works? You might wonder. Deep content is responsible for storing and managing enterprise related and business specific information in a way that alongside human readers, machine can also understand them. An enterprises can access those information for internal workflow data analysis. Since natural language processing (NLP) is in its infancy, bridging the gap between humans and machine is a colossal task. Because deep content is a manifestation of the data-first policy, the meta properties are highlighted and the spiders find it easy to crawl a site. When deep content is combined with quality content (it should be used this way), crafted for human readers, the site become optimized for both humans and machine, thereby leading up to a low bounce rate and an increased conversion rate. As you can see in the image above, the pattern resembles the English letter “F.” That’s why it’s called the F-shaped reading pattern. Apparently unrelated to SEO, this finding is of paramount importance for SEO. By following the eye-tracking pattern when designing the landing page, a marketer can offer visitors a smooth viewing experience and select the appropriate places for the CTA buttons. Placing an arrow mark on the top right which points to the left side follows the natural movement of eyes, according to the picture above. Placing the product image (not stock, original photograph) in the middle and the CTA buttons in top-to-bottom manner on the left side i.e. the tail end of the letter “F” is in sync with the F-shaped reading pattern. Site visitors are sure to find the layout and the content arrangement easy-to-navigate, they stay on the site for long and the bounce rate automatically decreases. Don’t expect visitors to land from desktop devices. They may use mobile devices to access your site. If your site is not optimized for such devices, a poor user-experience will be the outcome, visitor will leave the site and the bounce rate will go north. You don’t want any of these to happen, right? Then optimize your site for Smart devices. Mobile optimization is no child’s play. It requires marketers to adopt responsive web design (RWD), which keeps the layout and navigation items of the site intact irrespective of the device being used. Mobile users often report broken links, slow loading time, visibility problems of certain onsite elements, etc. Responsive design can fix everything. Adaptive web design (AWD) supplements RWD. The difference between the two is easy to comprehend. While RWD causes multiple changes on the same layout, AWD creates separate layouts depending on the device specs, especially the screen size. Use both of them to get the optimal result. Customers buy from vendors, whom they could trust. Testimonials from previous or existing customers can persuade new customers to buy from you. As Ryan Domm-Thomas of CrazyEgg has put, customer testimonials make customers promoting you to other customers. This is the fun part, and if you want to keep the fun alive, then don’t go for text-based testimonials as they are outdated and not credible enough. Upload a video which shows a satisfied customer describing his experience. Video testimonial best practices include telling the truth, be specific when sharing the experience and mentioning the benefits that the client has received. Videos are the most favored among all content formats. Hence, using customer testimonial videos will positively increase the retention rate and decrease the bounce rate. In 2016, online reviews have the power to make or break a business. Whether you are an online business or function offline, positive reviews from customers can help you become an industry leader. Negative reviews can diminish your chances to survive. A survey by BrightLocal reveals the power of online reviews. The survey findings show more than 80% customer read online reviews before deciding on a product. You can harness the power of online reviews to reduce your bounce rate. Ask happy customers to give you positive reviews on third-party sites. Then check for the availability of the APIs of those sites. In case the APIs are not accessible, take screenshots of favorable reviews and upload those screenshots on your site’s landing page. This is not integration in the truest sense, but it works. Integrating the above suggestions certainly will help, but perhaps the most important lesson is to have a keen eye on your intended audience. As the excellent article from Ocoos points out(HERE), the fundamentals of marketing are not suspended by the technology of the internet. With the customer in mind, having an experimental approach while you apply the seven tips shared here. SEO is still an unexplored territory, and tinkering with the strategies discussed here may create new marketing avenues. Who knows?